Ann has worked with internal audit departments of various sizes and across industries. The Whole Person Project, Inc. is an organizational development consulting and training firm, so you can trust her expertise on this topic! You can read the full article here: Ten Tips for Leading a Multi-generational Workforce. Make sure to register for Ann’s upcoming CPE webinar too! There is 1 CPE credit available for participating attendees. “Work hard and you will be rewarded.” “Respect those with seniority.” As the new breed of employee populates our companies, these business values are changing fast. Boomers and Gen Xers are working with a new generation raised in a disposable, technologically advanced, quantitative age. How can we work together, manage each other’s energies, and motivate performance? 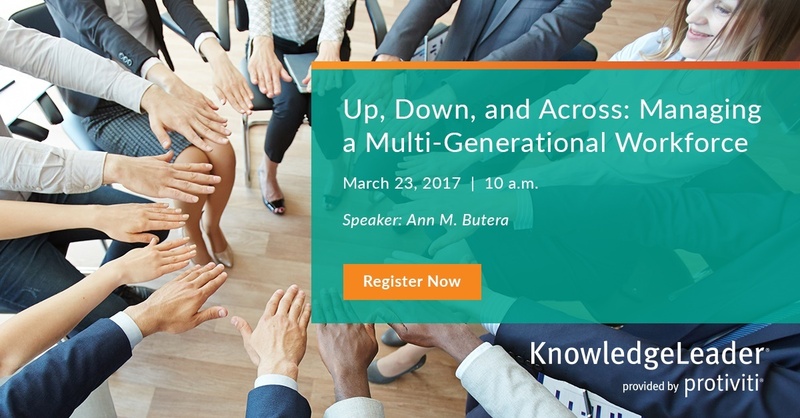 Whether you’re a team member or the team leader, you can benefit from understanding how to optimize the different generations’ skills.